Creativity reigns in the kitchen at Christmas. Your cupboards contain materials and ingredients to help you put together rice neck warmers, salad dressing in gasket-stopper bottles, a family bean bag game, favorite recipe book, cocoa mix and treats in elf mugs with peppermint stirring sticks, spiced cider mix, peas on earth soup, the list goes on. This gifting approach combines the charm of handmade and the economy of food staple utilization, which also helps reduce Christmas expenses. Fudge variety: My daughter Heather married her sweetheart, Paul, in San Diego last December and had a creative reception on the beach featuring street tacos and a gourmet dessert bar. Among the offerings were four flavors of fudge at a cut-it-yourself candy bar. There was a block of vanilla fudge with pearl nonpareils; pina colada fudge with coconut and dried pineapple and sprinkled with coconut shavings; a milk and dark chocolate blend; and a chocolate filled with pecans. Perhaps your loved ones with a sweet tooth would enjoy a fudge sampler for Christmas. If so, I would suggest adding in white peppermint fudge, too. Recipe collections: Another gift is a book filled with a collection of your loved one's favorite recipes. My mom created these one year, and it is my go-to for quick references; it is extra special because it is in her own handwriting. Another family framed some of their grandmother's recipe cards with black and white photos of their grandma for gifts, and it is a treasure as they remember family dinners and activities from long ago. Basket gift: A fun gift is created by gathering the ingredients for a favorite food, filling a basket with excelsior or dry natural material and artfully arranging the ingredients and recipe, with perhaps a new wooden spoon or utensil used in the preparation of the food. 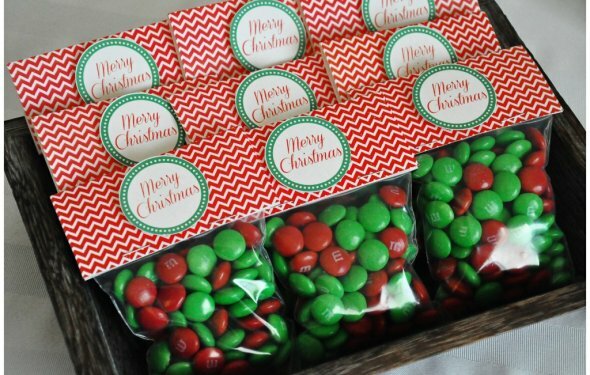 Wrapped in cellophane from the craft store, your creation will rival any commercial gift basket. We outfitted a beautiful enamel stockpot with the ingredients and recipe for tortilla soup, dessert and sparkling cider for a newlywed couple. Rice neck warmer: One of my all-time favorite gifts is a rice neck warmer that can be popped into the microwave for 2-3 minutes to create a lovely warm wrap for your neck or tired muscles. It's also a cozy companion, pushing back the chill on winter nights. I would not recommend using it for babies, however; it could be too warm for their tender skin. This is easily made with a quarter yard of inexpensive cotton fabric; a quarter yard of fleece, flannel or other soft fabric; about two pounds of dry white rice; a couple of drops of lavender or other essential oil; and sewing thread. Simply fold the fabrics and trim them to make 9-inch-by-24-inch pieces. The size can be adjusted if necessary. Fold the cotton in half so there is a 9-inch-by-12-inch piece, then in half again to a 9-inch by 6-inch piece. Mark the folded edges with a pencil or press with an iron. Unfold the fabric and refold with the right sides facing. Sew along one long edge and one short edge. Leaving only one edge open, sew along the four marked segments so you have a series of four pockets. Fill the first with about 1½ cups of dry rice and stitch the opening closed. Repeat with the remaining segments, adding a couple of drops of essential oil to one of the pockets. Make a long sleeve of the flannel or fleece by folding the fabric in half, right sides facing. Sew along the sides, turn right-side out and insert the rice-filled bag. Turn under the remaining short edge and stitch closed, or you may wish to add velcro so the cover can be laundered. Do not wash the rice bag or you will end up with a lumpy, wet mess. Elf mugs: Handled canning jars embellished with ribbon, paper crafts and lids with drinking straws make cute containers for homemade or commercial cocoa mix or favorite candies. Wash mugs, then hot glue on embellishments and a ribbon bow. Fill with recipients' favorite treats for sweet and thoughtful gifts. Unique Homemade Christmas Gift Ideas for Boyfriend. You could make a scrapbook of pictures of you and he doing things together, and even of each of you alone. WalMart has some neat kits for this that are really handy for a beginner.